The building is located at an important intersection within the city where urban elements converge, such as a new metro stop, an important government building, a commercial shopping center and the most emblematic park of the city. Being the first new construction in this zone and highly visible, the building attempts to combine the many existing and new diverse elements through movements that bring new shadow lines reflections and points of view. In the search for spatial wealth elements of the facade were eliminated, this is achieved by a design concept that removes strategic corners of the building. Where double and triple height spaces are generated. Where panoramic visual connections to the entire city, manage to activate these exterior areas traditionally dead, and replacing them with different social programs. These new exterior areas at the top of the building take advantage of the park's visual and excellent equatorial climate that prevails throughout the year. Deep perimeter balconies around the building help to reduce solar gain in the interior spaces allowing for the use of larger portions of glass in the façade, without sacrificing passive climate controlled spaces. The building contains a large roof garden that makes a visual connection with the surrounding Andes Mountains while creating usable green space for the building’s residents. The façade of the building uses a material process known as GFRC (glass fiber reinforced concrete). Molds were made in close collaboration with the architect’s digital model and the fabricators work shop to provide accurate and a well coordinated process. The concrete material in then sprayed onto the molds to create the final product. 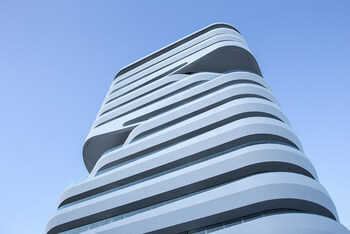 The design and the construction process of the building utilizes a repeatable patterning system to reduce the overall amount of molds used in creating the dynamic building facade. Advantages of this material are efficiency of installation, as panels are fabricated up to 4 meters by 2 meters tall. Molds are also able to be reused, reducing the material used and fabrication time. Also designed and built into the installation process is a system of adjustable metallic connections allowing the complex forms to align with ease. The final product is a continuous dynamic façade system.